We recognize that the people of our community support our business and strive to support our community. J. 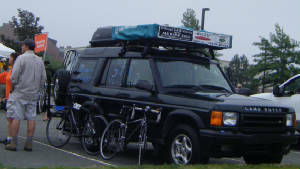 White's Volunteered to Assist Bikers Riding in the National MS Society Cape Cod Getaway. "No organization can depend on genius; the supply is always scarce and unreliable. It is the test of an organization to make ordinary human beings perform better than they seem capable of; to bring out whatever strength there is in its members, and to use each man's strength to help all the others perform. The purpose of an organization is to enable common men to do uncommon things." We are currently co-creating an art gallery like no other at our location, Interested in what we are doing? Read the Telegram's coverage on our open house event. We hosted the Metal Dash Weekend again this year. Fun was had by all. This year we walked in honor of one of our team members that has worked hard with medical care professionals to win his fight against Cancer. It is our honor to walk with Chris in our hearts and on our minds, as we look forward to seeing him with his health 100% restored. He as well as the research, medical professionals and science that heal are the miracles we will celebrate and support every step of the way as we walk with the UMass Medicine Cancer Center of Excellence on Sunday, September 25, 2011 for the 13th Annual UMass Medicine Cancer Walk. The five-mile walkathon raises funds to benefit cancer research, care, equipment, facilities and world-renowned medical professionals at the UMass Medicine Cancer Center of Excellence in Worcester, MA. 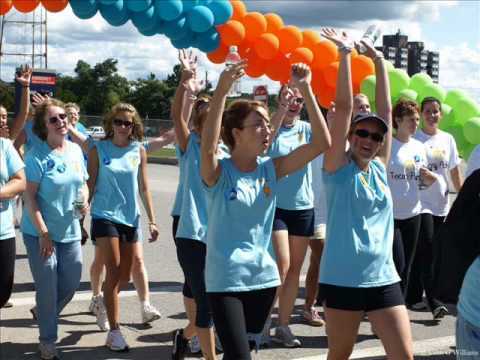 Now in its 13th year, over 60,000 walkers have participated in the event and have raised over $6 million. Way to go Daisy Troop 85! 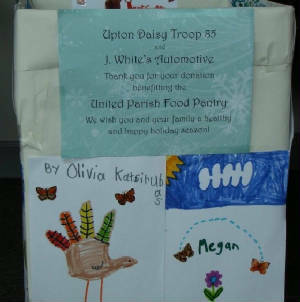 We were honored that the Daisy Troop 85 placed their collection box in our lobby for their holiday food drive! To each of you involved, please accept our sincere gratitude for your generosity. Together our customers and friends donated enough food for the United Parish Food Pantry to fill the Daisy Troops box three times! In support of the Daisy Troop 85's efforts, we held a drawing for a free oil change to those who contributed. Congratulations to Jen Katsirubas of Upton for helping others and for winning the drawing! We would like to express our gratitude to the students and faculty of Touchstone Community School, for allowing us the honor of displaying their artwork in our waiting room. The 7th and 8th graders at Touchstone Community School made the prints that beautify our waiting room! As an extension of both art and mathematics, students began with creating designs using mirror symmetry on squares of paper. These designs were then carved and printed rotationally in two directions. First, keeping the corner of the print facing into the center of the square printing paper and second, keeping the corner of the printing facing outwards. This can be seen in the orange and yellow prints, which were done by the same student. In the orange print, the lines are converging into the center. In the yellow print, the lines seem to move towards the four corners of the print. We are so excited about our connection with the artists at Touchstone Community School and we welcome you to stop by in person anytime to take a look first hand! Joining the interests of others, by working together to foster a sense of community and to support one another in reaching both common and individual goals is one of the greatest rewards of our day to day efforts.